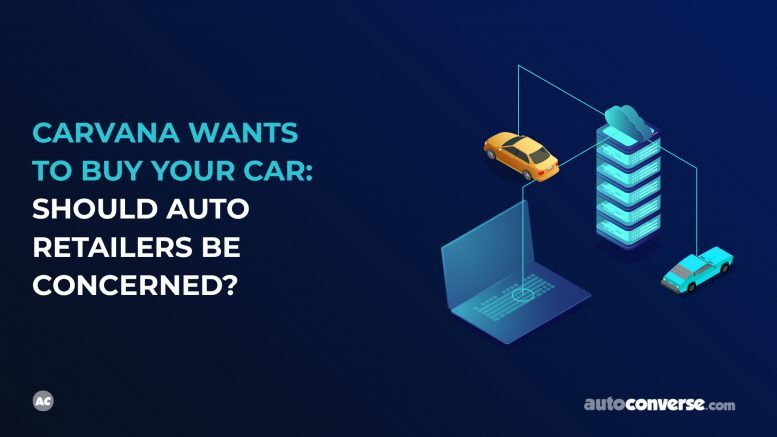 Carvana Wants to Buy Your Car: Should Auto Retailers Be Concerned? With Carvana’s advertising push to buy your car – no trade attached, the automotive darling startup has once again staked its claim against the traditional dealership experience. “We don’t play dealership games” is the mantra. And while the company is still not profitable, pivots like this garner attention. In a recent conversation, industry veteran Ed French responds, “Absolutely! Carvana is a disruptor,” when asked if franchise dealers should be concerned about this play. Carvana presently burns about $50M a quarter. The startup sold approximately 100,000 cars in 2018, but it wants to be selling 2M cars a year within the next 2-3 years. In order to do this, it’s going to need inventory, and it will of course have to be in business. With an average loss of $800 per car, according to French, Carvana must find a way to not only acquire more vehicles, but be more profitable. And who best to look to than the undisputed leader in used cars – Carmax. In contrast, Carmax in 2018 sold more than 770k vehicles. And it profits about $200M each quarter according to a 2018 press release. The nearly 30 year old company buys EVERYTHING. And with more than 200 locations nationwide, one advantage Carmax has over all others is its wholesale platform. According to French, Carmax wholesales about 100,000 cars a year, internally and externally. And profitability on its wholesale business is “outstanding.” The reason why is because Carmax retail outlets have the ability to wholesale vehicles from location to location without the typical auction costs that its competitors face. Carvana sees this, and understands that it too must enable itself with the same advantage if it’s going to compete and be profitable. In addition to providing car buying customers with an online solution to purchasing and trading in their vehicles, we also allow customers to sell their vehicles outright without the stress, anxiety, and time spent that comes with attempts to sell privately or to a dealership. While there is truth to the idea that doing business with dealers is considered worse than a root canal, it is only marketing rhetoric. If Carvana wants to profit, which it must, then it can’t risk offering more on vehicles than they are worth. In that sense, they can’t compete on price, only on customer experience, which is something all dealers have the ability to compete on as well. While there is truth to the idea that doing business with dealers is considered worse than a root canal, it is only marketing rhetoric. Carvana seeks to set itself apart from the traditional dealer, however, as we can see, it is clearly interested in adopting business strategies that savvy dealers (such as Carmax) have down to a science. Be the first to comment on "Carvana Wants to Buy Your Car: Should Retailers Be Concerned?"